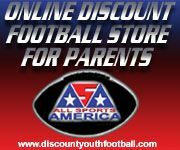 Discount Youth Football provides football equipment to families at discount prices. Provides information on field closures due to inclement weather. Liberty Mutual Grant Program for sports organizations! USA Football site for coaches, players, and parents. Provides information on how/where to obtain Virginia DMV ID card which is needed for FCYFL weigh ins.